Morning gang! Thanks for tuning into the show last night, I hope you enjoyed it. Extra big ups to my special studio guest Big Nick D for yet another smashing live mix. I really enjoyed it, I’m sure you did too. The next Hubie Sounds will be on Tuesday 25th June @ 9pm BST – live and direct on NSB Radio! Hi everyone. Hubie Sounds is back this Tuesday with another Bass[sic] Session! Yep, me and the Bass[sic] team are throwing another big party in Shoreditch this weekend – with special guests Evil Nine, Purge and LOADS more – so to celebrate I’ll be presenting another show dedicated to all things bassy! But wait, there’s more! This time around I’ll be joined in the studio by my good buddy and fellow Bass[sic] team member and resident DJ, Big Nick D! The Big Square Records head honcho will be hitting the decks with a live mix of all the big tunes that are exciting him at the moment. And I should warn you, he’s an excitable character so be prepared to be… yes that’s right, excited! 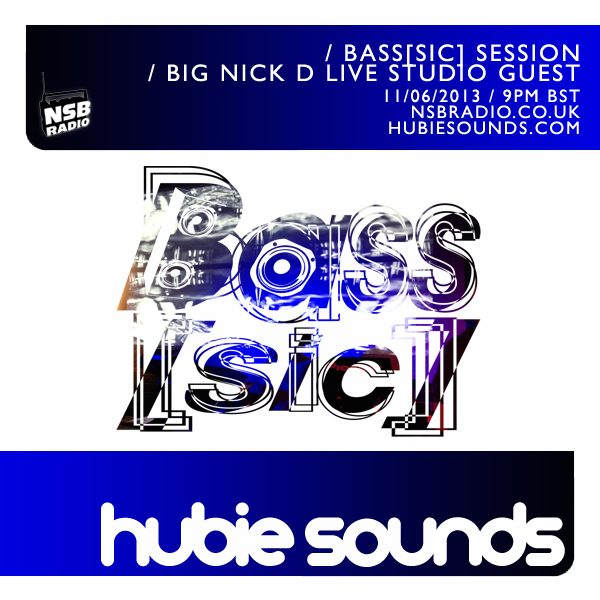 The Hubie Sounds Bass[sic] Session – Tuesday 11th June @ 9pm BST – live and direct on NSB Radio! Don’t forget to come and say hello in the Chatroom! Thanks for tuning in last night, we hope you enjoyed the show. We’ve had lots of positive feedback about the Breaks Retrospective so you can expect to hear more in the future! Thanks for tuning in on Saturday night, I hope you enjoyed the show! For those of you who would like to download the show, it is now available from the Brap.FM archives RIGHT HERE! Voting closes very soon, so please get your votes in asap! Thanks for your support everyone! Make sure you tune into the next Hubie Sounds on Sat 21st Feb direct from Messymoo Towers for some live house party carnage! Same Brap time, Same Brap channel! Don’t forget to tune into the next installment of Hubie Sounds on the 20th of September. Same Brap time, same Brap channel! HUBIE SOUNDS This Sat 6th September on Brap.FM! This Saturday night Hubie Sounds will broadcast live and direct over the interweb Brapwaves from Hubie Sounds Studios with a fine selection of fresh tuna and block rocking beats! To celebrate the release of their definitive singles collection, Brotherhood, I will be focusing on the legendary beatsmiths The Chemical Brothers with a slightly twisted version of my usual feature entitled ‘Hubie Would Like To Have Electronic Battle Weapon Babies’. Yep that’s right, rather than digging through their vast commercial back catalogue, I will instead be focusing on Tom and Ed’s more club-friendly releases, the Electronic Battle Weapon series. As well as those dancefloor bombs, I will also be dropping tuna by the likes of Underworld, Evil Nine, Herve, Miles Dyson and Kidda. So if any of that tickles your fancy, check out Hubie Sounds this Saturday 6th September 8-10pm, live and direct on Brap.FM!